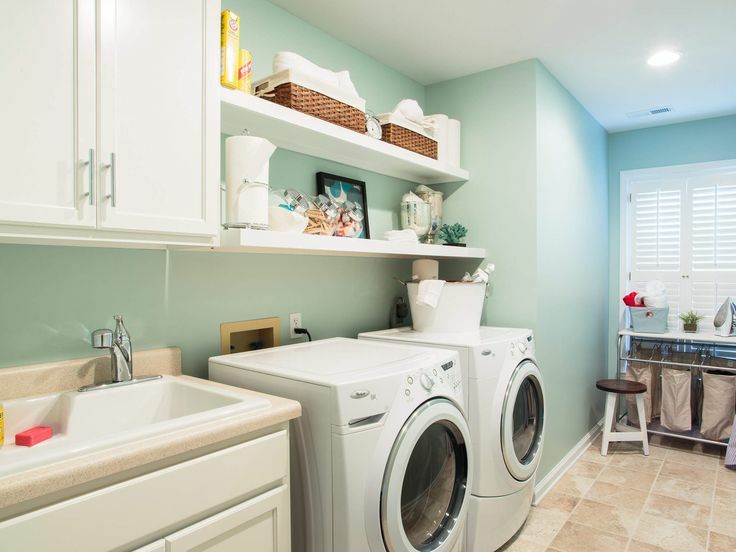 I’ve decided my laundry room is way overdue for some love. It’s just one of those conclusions I came to over the weekend. That’s what happens when you go into IKEA with no clear direction. You end up walking out with shelves and lighting and next thing you know you’re painting the laundry room! But hey, YOLO! I’m going to paint the walls Aqua Smoke by Behr which is the same color as the kitchen. I’ll also be painting the cabinets white and possibly using the same hardware I used in the guest bathroom. I ordered a couple SnapPower outlet covers to add some cool ambient lighting under the cabinets and shelves, and I’ll accessorize with some wire baskets. We’ll also add a Nest Protect to the ceiling and additional under-the-cabinet lighting. 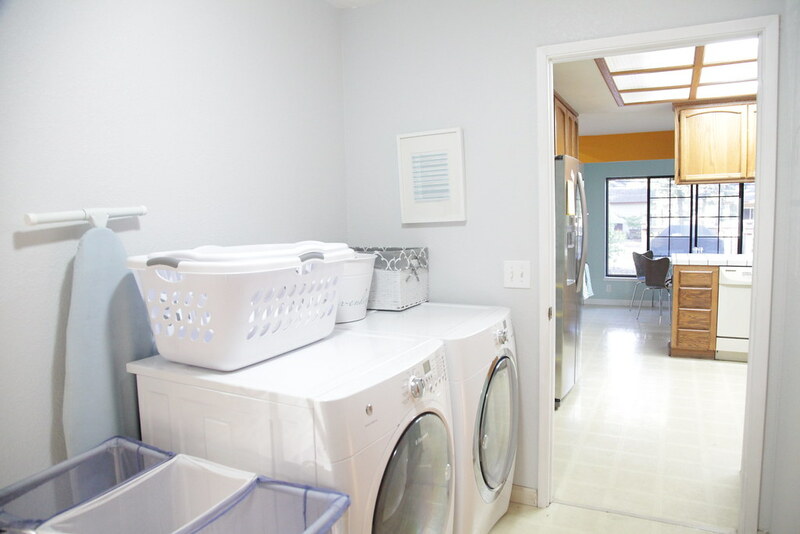 Follow Cristina Robinson’s board Rooms | Laundry on Pinterest. As much as I want to do floating shelves, Joshua encouraged me to do shelves that were a bit more sturdier, so I opted for the EKBY ÖSTEN / EKBY VALTER combo from IKEA. My plan is to have all my laundry products living on these shelves, so it’s important that the shelves can stand the weight. I haven’t 100% commited to what type of baskets I want, and although I am leaning towards wire baskets as seen in my mood board, I’m not going to get anything until I’ve finished all the painting. I do like the idea of putting my laundry pods in some nice canisters. I’m also leaning towards getting something like this as a mini drying rack. I would also like to get some sort of rack that will hold my ironing board, but I am not sure if I want something that will mount to the wall or to the door. Down the road when we remodel our kitchen I would love to replace the cabinets altogether. For now, I will be painting them. The countertop is also oak, and I plan on staining that so it’s darker; everything else will be painted white. The floor-to-ceiling cabinet is my pantry. Inside, I would like to add one more shelf and pretty them up with some contact paper. As for the other cabinets, I am heavily debating whether or not I want to treat it as a butler’s pantry or just additional storage. 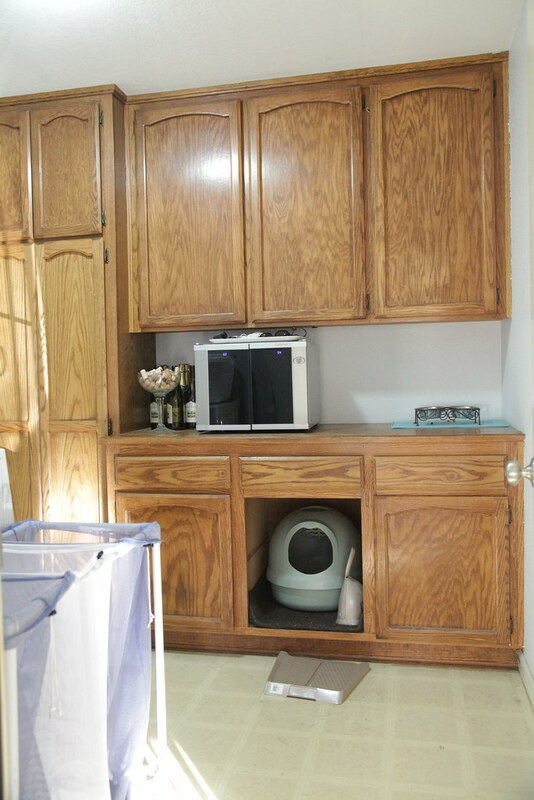 Right now one cabinet has cleaning supplies, one has pet supplies, and the other has laundry supplies; the lower cabinets all store litter boxes. Now that I have all my plans and ideas out on paper (or in this case out on the web) next step is clearing everything out and painting!